Our customer called us after he hit the garage door as he was backing out. The garage door wasn’t fully opened before he started moving. 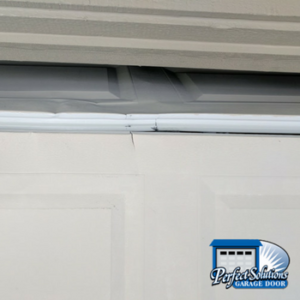 This impact damaged the bottom two panels of the garage door. Whoops! You can see the damage in the photos below. The impact cracked on panel, and dented the other panel. Generally when you have a damaged panel, repair is either a brand new garage door or a panel replacement. 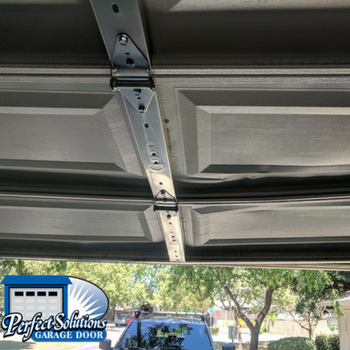 If you’re lucky and your garage door is still being made, you can get panels to replace the damaged ones. 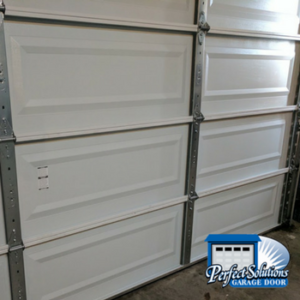 This is a cheaper solution than purchasing a brand new garage door. If your door is old, or replacement panels aren’t available, it is time for a new door! Fortunately, their Clopay garage door is still in production. We were able to order 2 new replacement panels quickly. They had painters scheduled for the end of the week, so once the panels arrived, we headed over to install them. Installation only took a few hours, and then they were ready for paint! This door is relatively new, so being able to switch out the damaged panels is a great thing! The door looks like new, and it was a much cheaper fix than replacing the door. After we installed the two new panels, we also balanced the door as the impact put it off balance. We then lubricated the door and garage door opener. 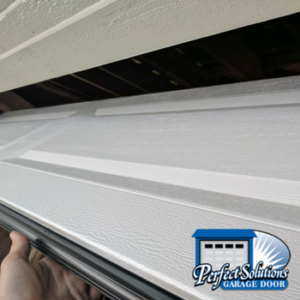 We recommend lubricating your garage door at least every month, or at least quarterly. Never use WD-40, but instead a silicone or lithium lubricating spray. You can find these at any hardware or home improvement store. Now the doors are good as new and you can’t tell there was ever an impact to the lower panels of the door. This entry was posted in Blog, Garage Door Repair and tagged damaged garage door panel, replacement panels. Bookmark the permalink.